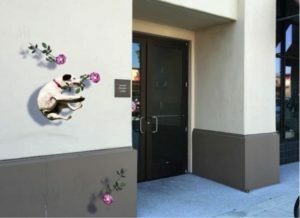 The Redwood City Improvement Association, a non-profit community benefit district that works to enhance Downtown Redwood City, will install six interactive murals to be completed by Jane Kim, a local artist from Cole Valley, San Francisco. Kim’s project is titled “Flora from Fauna” and will show unlikely residents of Redwood City offering gifts of Chrysanthemums to passersby. A variety of animals will be included in the murals like bald eagles, a fox, squirrels, deer, a Great Blue Heron and a domestic dog. In 2016, the Redwood City Improvement Association donated $30,000 for public art installations in the Downtown area to make the downtown district even more vibrant. The first half of the project was completed last year when 30 shadow art stencils were installed on sidewalks and community spaces in the Downtown district. The second half of the project will begin this month with Kim’s mural installations on six different buildings throughout Downtown.